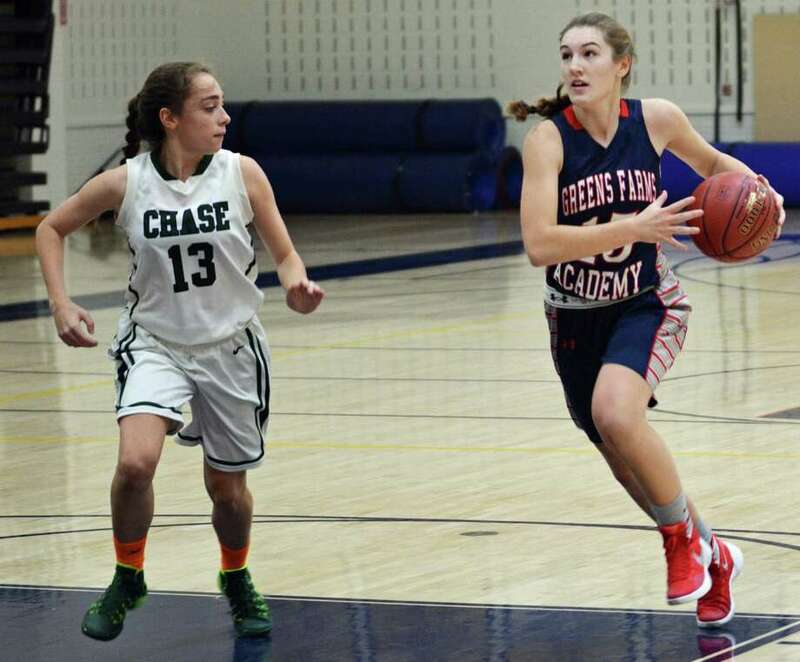 GFA junior captain Lexi Kimball, right, on a breakaway during the team's win over Chase Collegiate (59-25). Kimball already has 117 points and 23 steals in four games this season. The Greens Farms Academy girls basketball team went 1-1 last against NEPSAC opponents Chase Collegiate and The Watkinson School, leaving GFA at 2-2 on the season. Last Wednesday GFA defeated Chase Collegiate behind 24 points, 10 steals and six assists from Lexi Kimball. The Dragons' defense combined for 25 steals. Junior Olivia Sullivan had 13 points and 5 rebounds. GFA faced Watkinson School last Saturday and lost 80-53. Kimball finished with a game-high 31 points, including six shots from behind the arc. Sullivan finished the game with 11 points. After two weeks of play and four games, Kimball has 117 points and 23 steals, earning her the award of News Channel 12's Athlete of the Week. The Dragons traveled to the Loomis Chaffee Holiday Duals last week. Forfeiting several weight classes and missing several key starters, the Dragons were never able to make up the points they were giving up and were defeated by several tough teams including Brunswick, Lawrenceville (New Jersey) Loomis Chaffee, and Northfield Mt Hermon. Sam Stuart was undefeated on the day, pinning all four of his opponents. GFA’s girls squash team suffered a 7-0 defeat to Westover last Wednesday. losing 7-0. The team’s No. 1, sophomore Katie Mackle played the closest match of her season, losing 3-2 (1-11, 11-9, 11-3, 7-11, 11-8). GFA’s boys took on Brunswick and lost 4-3. Jack Mackle, playing No. 1, dispatched his opponent in three games, 11-2, 14-12, 11-9. Sophomore Duda Voldman won his match in four games 6-11, 11-2, 11-3, 11-7. The team’s No. 6, sophomore Alex Necakov (Darien), also won his match in a decisive three games, 11-9, 11-2, 11-8. GFA competed in a home meet last Saturday against Greenwich, Milford and Bridgeport Central, and finished the day with a 2-1 record, winning against Milford 19-8 and Bridgeport 20-7 and losing to Greenwich 19-8. Boys foil lost 6-3 to Greenwich; sophomore Teddy Gartland went 3-0. The boys' epee squad defeated GHS epee 6-3. Ryan Petschek finished 1-2. Phil Nicopoulos fenced with a French grip epee for the first time and finishing the round 3-0. Junior Luke Duffy went 2-1. GFA narrowly lost against Milford epee, ending the round 5-4. Petschek and Nicopoulos both went 1-2. Duffy finished the round 2-1. GFA competed in a home meet last Saturday and defeated all three schools: Greenwich 14-13, Milford 26-1, and Bridgeport Central 20-7. The girls foil squad defeated GHS 6-3. Seniors Kate Koster (Westport), Kate Allan and captain Erica Im all finished 2-1. Against Milford, Im and Koster both finished 3-0. Allan tied 1-1, subbing in newcomer freshman Alida Deutsch (Westport) who won her bout 5-3. The team lost to Central High 4-5, with Im going undefeated 3-0. Girls saber lost 9-0 against GHS.